NETHERLANDS, Wilhelmina, one gulden, 1898 (KM.122.1). Peripheral golden highlights, uncirculated. In a slab by NGC as MS63. 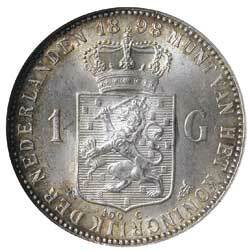 NETHERLANDS, Wilhelmina, one gulden, 1892 (KM.117). Choice uncirculated. 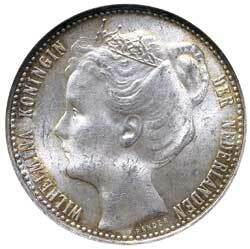 NETHERLANDS, Wilhelmina, half gulden, 1898 (KM.121.1). Choice uncirculated.